The MT-4308W is a mobile POS specifically designed for both the retail and hospitality businesses. It is a 8” tablet supporting MSR/RFID attachment, pistol grip with built-in 1D or 2D barcode scanner, 2nd removable battery and an optional dock station to transform the device into a full-fledged, stationary POS. The MT-4308W is proven to provide businesses with the mobility of a tablet and the functionality of a fixed POS terminal. Hand strap provides extra protection and eases the user’s fatigue during the hours of operation. In addition to the charging dock station, both attachments PG-201E and TA-500 house a removable battery to vastly extend the overall operating time. The optional printer dock station has a full array of connectivity ports, allowing the device to perform as an all-in-one POS. The MT-4310W is a mobile POS specifically designed for both the retail and hospitality businesses. 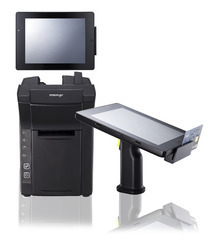 It is a 10” tablet supporting MSR/RFID attachment, pistol grip with built-in 1D or 2D barcode scanner, 2nd removable battery and an optional dock station to transform the device into a full-fledged, stationary POS. The MT-4310W is proven to provide businesses with the mobility of a tablet and the functionality of a fixed POS terminal. Ergonomically designed pistol grip shaped handle PG-201E for easy carrying the tablet along with an additional battery and optional built-in barcode scanner. The MT-4008A is a mobile POS specifically designed for both the retail and hospitality businesses. It is a 8” tablet supporting MSR/RFID attachment, pistol grip with built-in 1D or 2D barcode scanner, 2nd removable battery and an optional dock station to transform the device into a full-fledged, stationary POS. The MT-4008A is proven to provide businesses with the mobility of a tablet and the functionality of a fixed POS terminal. The MT-4210A is an Android version of mobile POS that provides businesses with the mobility of a tablet and the functionality of a fixed POS terminal. It is a 10” tablet supporting MSR/RFID attachment, pistol grip with built-in 1D or 2D barcode scanner, 2nd removable battery and an optional dock station to transform the device into a full-fledged, stationary POS. The MT-4210A is proven to provide businesses with the mobility of a tablet and the functionality of a fixed POS terminal. Ergonomically designed pistol grip shape handle PG-201E for easy carrying the tablet along with an additional battery and optional built-in barcode scanner.